Students from Nathaniel Rochester Community School participated with the RIT Pillars of Hope group in a Jeopardy-style program during Black Awareness Month. The Pillars of Hope program, a City of Rochester initiative, pairs area elementary or middle schools with local professionals. RIT’s Pillars of Hope group is two-years old and has participants from the ranks of faculty and staff. At first, it was hard for the students to imagine that the tall professor in the suit used to be a seventh grader just like them. But when Chance Glenn started to talk about his life growing up, then showed them his grammar school photo, they heard a story about a boy’s perseverance and a grown man’s dream of being a teacher realized. The students made the connection that there were possibilities for them, too. Glenn and his RIT colleagues are part of the Pillars of Hope program, a City of Rochester initiative, where teams of local professionals adopt an elementary or middle school in the Rochester City School District. Team members visit classrooms, lead activities and infuse the learning with real-world stories and examples of how the adults overcame obstacles that the students might encounter in their own quest for success. The RIT Pillars of Hope group is 2 years old and 48 members strong, says Venessa Mitchell, the RIT team organizer. She leads the group, often 10 at a time, for visits to Laurie Payne’s seventh grade class at Nathaniel Rochester Community School in Corn Hill. RIT’s Pillars of Hope team is preparing for its upcoming session, a Jeopardy-styled game show. They will play the popular trivia game with the students Feb. 18 at the school to enhance students’ understanding of the significant contributions of African Americans in business, science and the arts. “The teacher was so excited to see all the men that had come because some of the kids don’t have fathers in their homes,” says Mitchell, an administrative financial coordinator in the Kate Gleason College of Engineering. 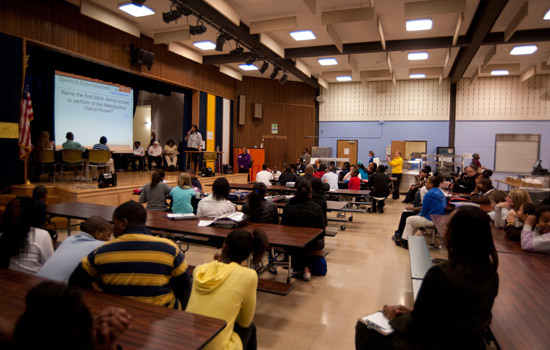 “There is a fair amount of women participating, but there is really a lot of men committed to the programs.” In the United States, less than half of all African American males will complete high school, one third between the ages of 20-29 are in correctional facilities and 69 percent of African American students cannot read at their grade level in the fourth grade, according to researchers at the National PTA and Human Rights Watch. Programs like Pillars of Hope look to change that. The participation of male professionals from RIT can provide the role models necessary to increase the percentages of young, African American males completing high school and aspiring to college, Glenn explains. Glenn’s activity with the photographs took place during last year’s program, and it was about overcoming adversity. He asked all the RIT participants to bring copies of photos from their elementary school years to show the students. “I had to call my mother for a photo,” says Mitchell, laughing. The photos were cut up like puzzle pieces, and the students had to piece them back together. They were then read a short story about that individual’s experience growing up. They’d win prizes for guessing which adult mentor was the ‘child’ in the photo. Glenn expects to do the activity again in this year’s program. The message was also about how there are many pieces of an individual’s life and situations that occur over time that make you who you are, says Mitchell who participated on the Pillars of Hope team at the University of Rochester where she worked before coming to RIT. “RIT is big on community service. I just felt like there was an opportunity to do something like this,” she says. To learn more about the RIT Pillars of Hope group, contact Venessa Mitchell by phone 475-2162 or email vmmeme@rit.edu.